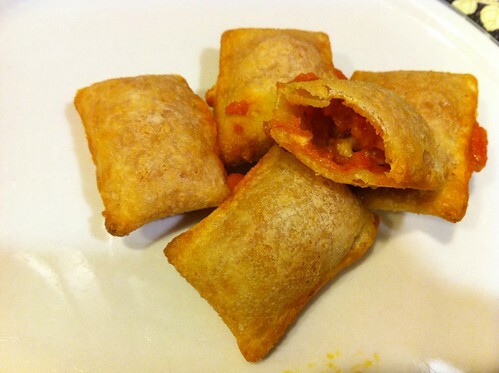 I gotta admit it, never had Totino’s or Jeno’s pizza rolls, until tonight. buh-buh-buh-wha??? but you are the Junk Food Critic!!!!! How could you have NOT had these before? Of course I knew of them. I would see them all the time next to the Totino’s pizzas. On those occasions I would just buy the pizza. Even as a kid the novelty of them were lost on me. Why eat something pizza-ish when I could just a pizza right next to it? Oh and one more thing. As a kid, I was blessed to be within a 7 min walk to MAZZIO’S PIZZA. They used to have a mini-pizza lunch special that was perfectly sized and priced. That and my free-refills-mazzios-cup made this pretty much a no-brainer. Flash-forward to the other night when I am at the frozen-foods aisle lamenting the state of frozen pizza and I saw the Totino’s Pizza rolls and thought “why not”? Immediately after dumping the contents of the box onto a cookie sheet I knew what I was in for. These things were gonna cook….burst open…and all the pizza-y-goodness it might hold will leak out the gaping wound. 10 mins later this is exactly what I found. One lone survivor out of the whole box remained intact. Taste-wise I gotta say these are not too shabby. I wish the “roll” was more bread/crust-like rather than egg-roll-ish in texture. But I get the appeal. These had a snappy pepperoni-bite and some decent sauce/cheese ratio. Even the six-year-old that runs my palate could see how these could be great come cartoon-watching-time… but he and I both still agree…why not just get a full-blown pizza?